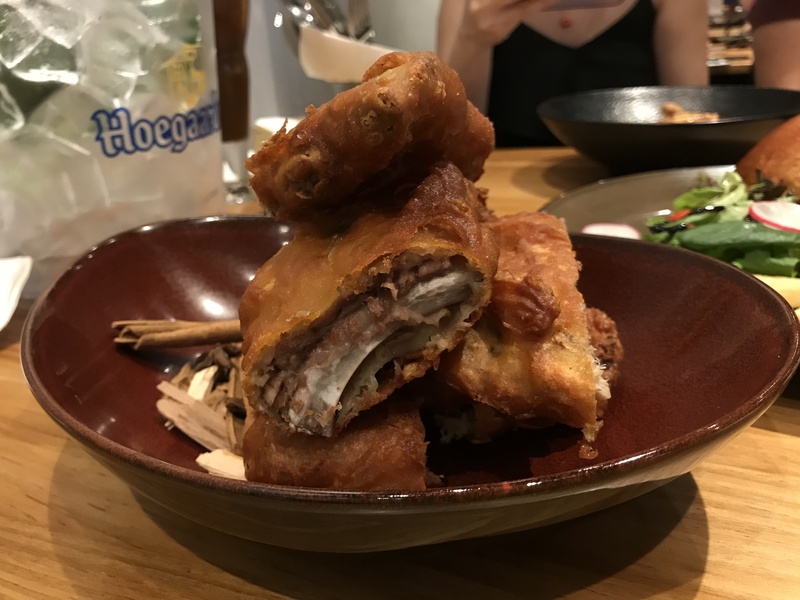 Joo Chiat is known to be full of good food (lucky you, Easterners!). 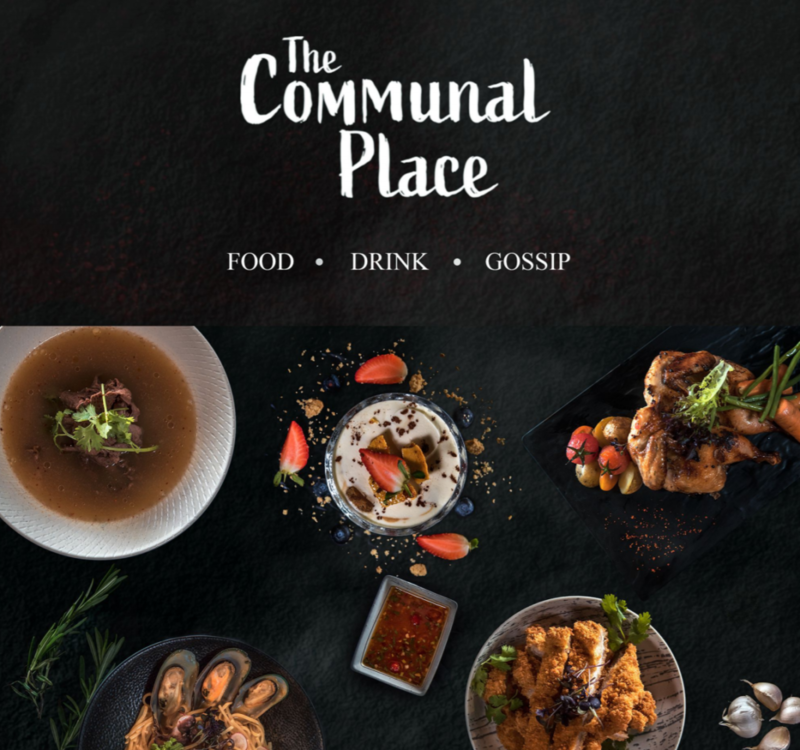 It might be difficult to agree on one place to eat with your friends and family, but The Communal Place should be at the top of your list! From good food to chill environment, they have it all. The pork ribs are a dish meant for sharing, so you can try more dishes with your family and friends. The baby back ribs are served with cinnamon and garlic chilli sauce. 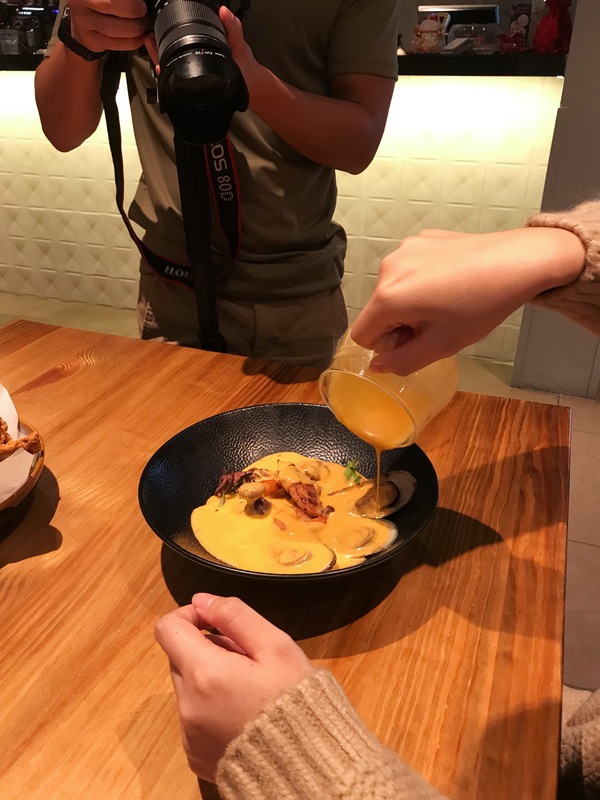 Not only is it yummy, but it’s also a dish with pretty Instagrammable theatre. A serving of tasty ribs is enough to satisfy any hungry stomach, but that’s not all- your eyes feast as well. 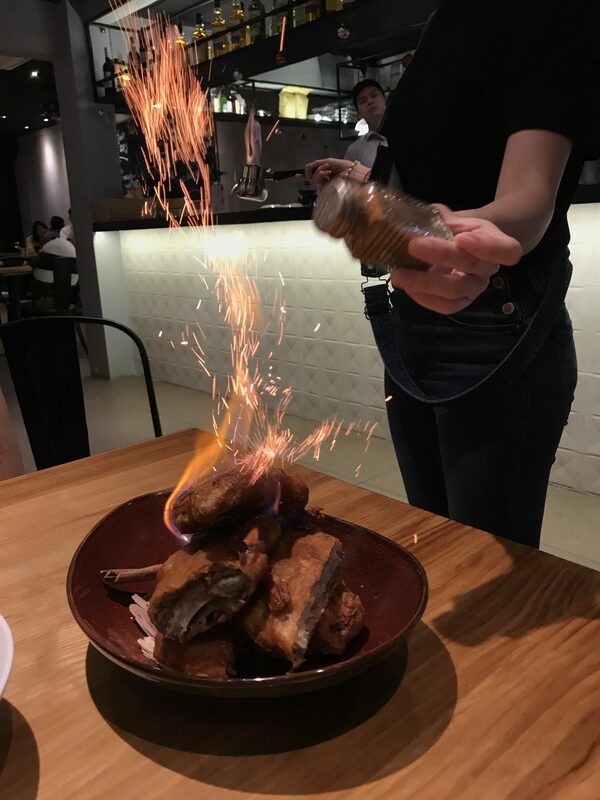 The exciting part comes when they light it on fire. Every time cinnamon is added, the whole thing flares up in a shower of sparks. It’s very theatrical and Harry Potter-esque. But not only is it nice too look at, but it’s delicious as well. After all the fire action is over, the garlic chilli sauce is added. 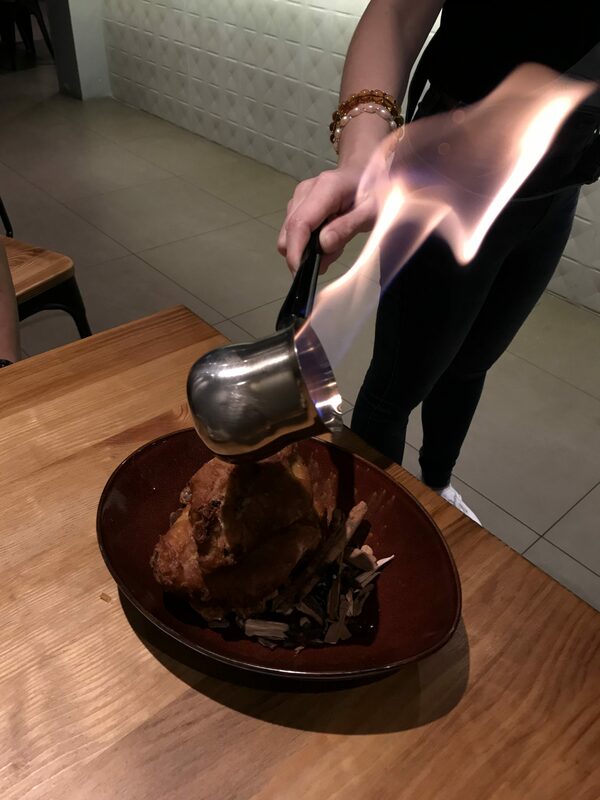 It complements and enhances the flavour of the meat, along with its crispy outer shell. These pork ribs are rather unique in terms of flavour and texture as well. The flavour is significantly nutty and has a pleasant slightly charred taste. 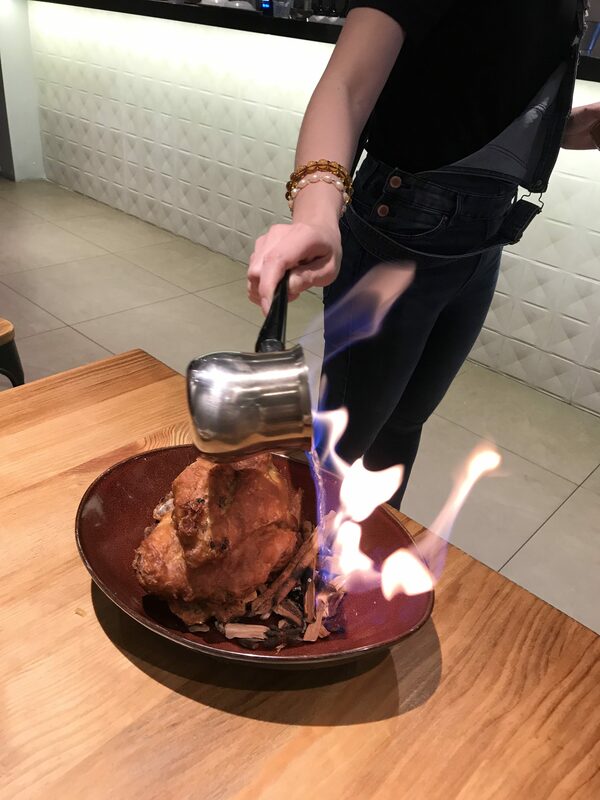 The meat is well cooked and the outer layer is crispy, making the texture satisfying to bite into. I have never tried anything like this before, so it’s definitely worth a go. The bouillabaisse here is absolutely delicious, and was one of our favourites. For the uninitiated, this dish is a thick fish soup/stew. 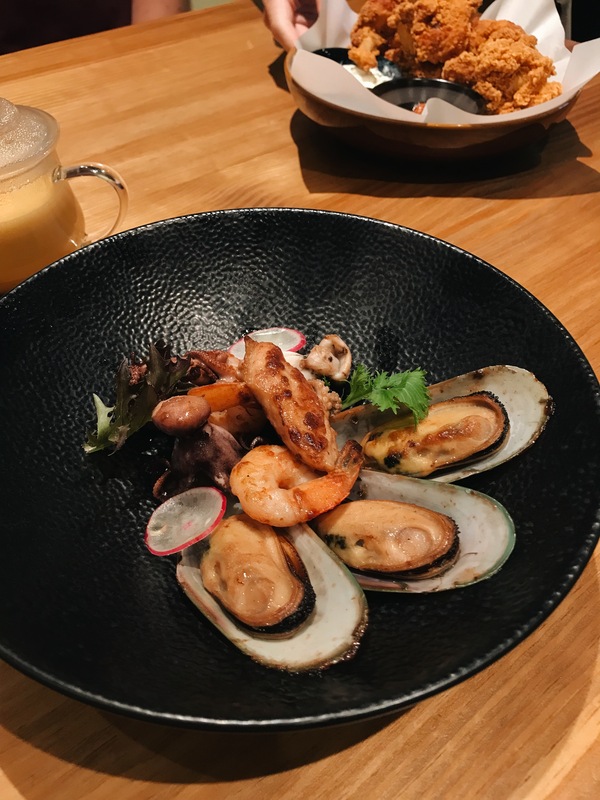 At the Communal Place, the seafood and other ingredients are carefully assembled, and the broth served at the side in a little jug. Before the broth is poured over the ingredients. This was definitely one of our favourites. The broth is thick, creamy, and lavish, chock full of great flavour and umami. It is not overly fishy either, but maintains a very nice balance. It is so flavourful it might even get gelat if you eat too much, but the portion size is just nice. The ingredients, of course, are great as well. The baby octopus is not overcooked, but fresh and bouncy. The mussels are nice and springy too, complementing the rich broth. This was also one of our favourite dishes. 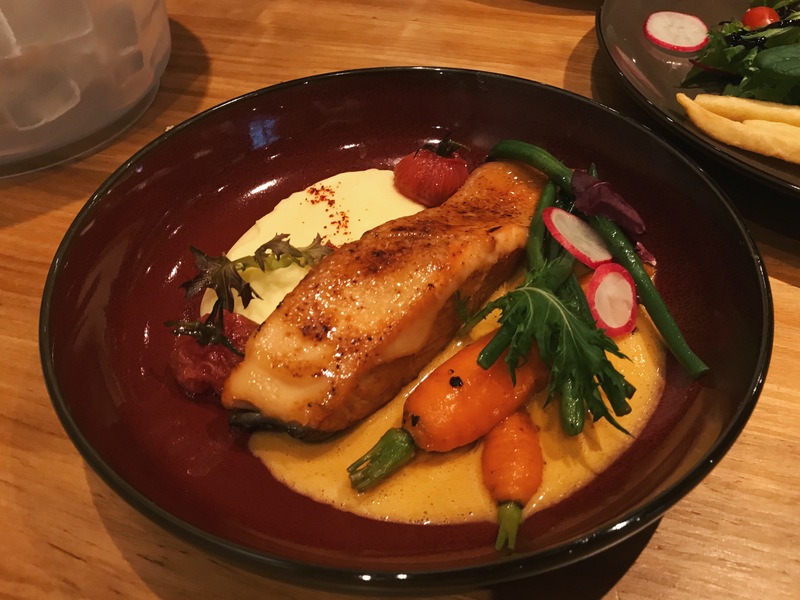 The salmon is cooked to perfection and served with miso paste, bouillabaisse foam, mash, and glazed vegetables. Yes, you heard that right- the bouillabaisse previously mentioned has been incorporated into this dish- and boy, does it taste good. Personally, as someone who does not typically like cooked salmon, I literally swallowed this dish. The salmon is cooked just right and is not overcooked and dry. The flavours go very well together, and the bouillabaisse foam adds a big oomph to the dish. Combined with the miso, every bite is a decadent explosion of taste. The vegetables are a nice touch to make the palate lighter after eating something so concentrated with flavour. 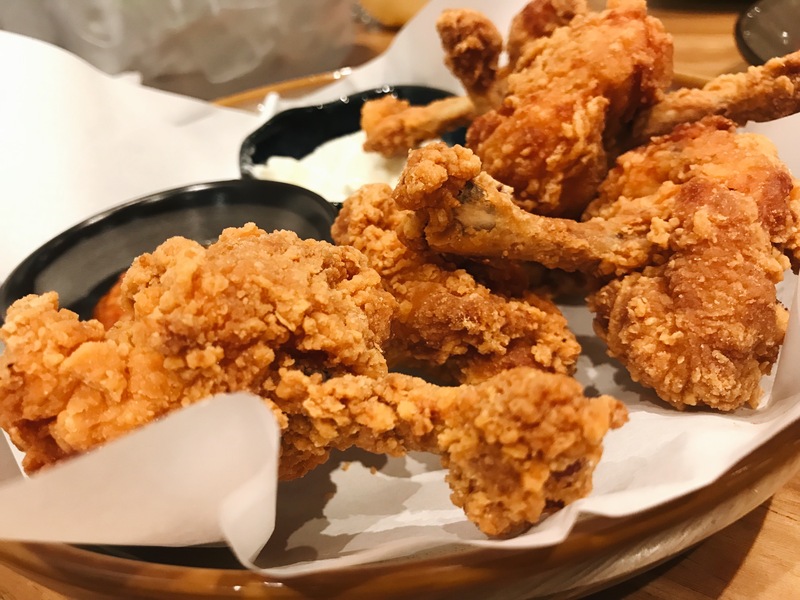 Fried chicken fans will be excited for this. The Lil Peckers dish comprises of crispy deep-fried chicken tulips, served with both sambal chilli and tarttar sauce. The chicken has been cooked to perfection, the flour on the outside crispy and nicely seasoned. The chilli goes best with the chicken- it is not too spicy, but has a decent kick and is also rather sweet. You cannot go wrong with a burger, and The Communal Place does their quite nicely. 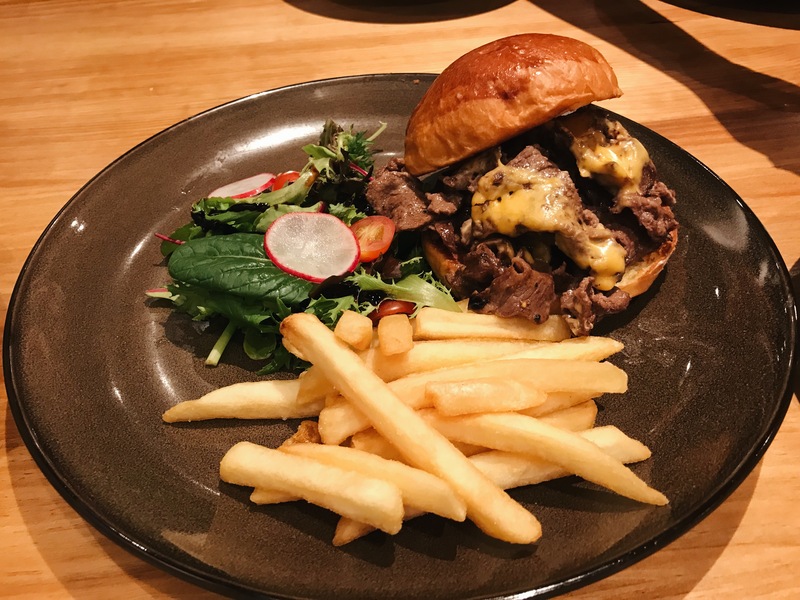 The cheese steak burger consists of shabu-shabu beef and carmelised onion sandwiched between two buttery and lightly toasted brioche buns. It is also served with fries and a salad on the side- you can’t get more classic than that. The cheese tastes a lot like nacho cheese- rich and flavourful,. With the beef thinly sliced and simply done, the dish is well-balanced and hence not unpleasantly heavy. 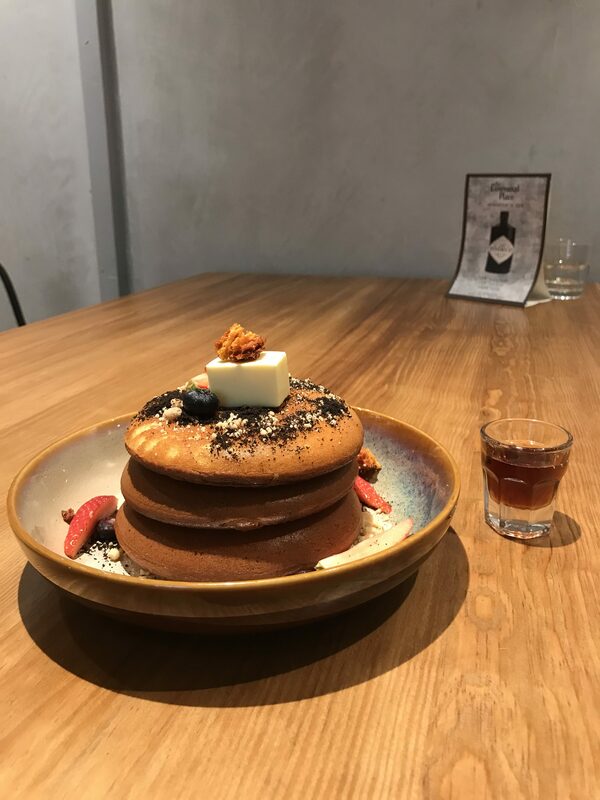 If you are a huge fan of pancakes and brunch, then this is the place to get wonderfully thick and fluffy pancakes (that are also extremely photogenic). Look at that. So good. Not only is it incredibly pretty-looking, but it tastes good as well. The pancakes are not too overly dense, but moist and fluffy. Crisp on the outside and airy on the inside, the plump and inviting pancakes are a must-have for any brunch enthusiast. 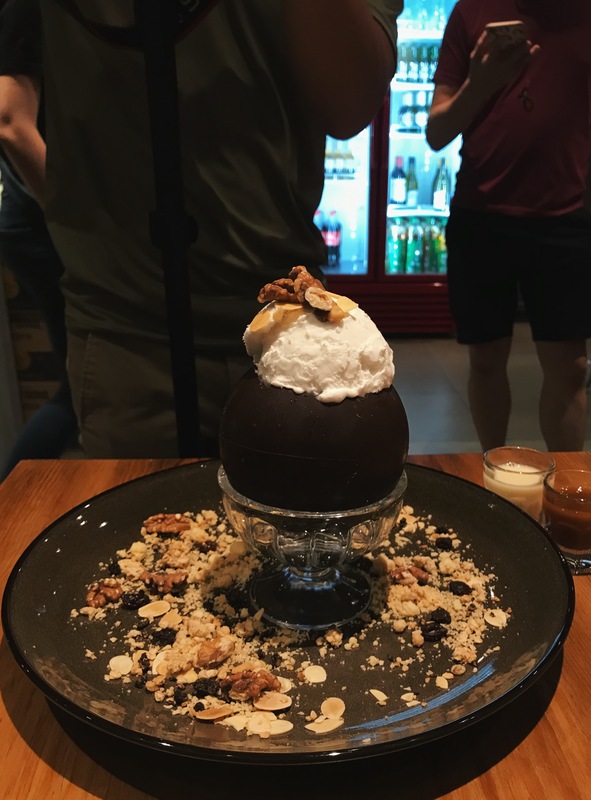 For dessert, the Chocolate Bomb will satisfy your sweet tooth. Similar to the pork ribs, it is also a rather attention-grabbing dish. It’s a pretty dramatic presentation, so remember to keep your phone camera ready to go! It’s really commendable how The Communal Place serves dishes that don’t just engage your tastebuds, but also satisfy visually as well. This is a rather sweet and indulgent dessert, so do share it with friends and family. Interestingly, they also add popping candy into the dish. This might sound strange, but it actually goes really well together with the rest of the dish. It adds a new dimension of texture to the dessert, so you will not get bored of eating this at all. The chunks of cake are pretty grounding and balance out the sweetness of the dessert. The ice cream was coconut ice cream. The overall combination is a really good balance of all the different flavours, so it is not too overwhelming in any component (especially sweetness). The food is honestly of a very good standard, and some dishes really shine a lot, such as the miso salmon. The environment is also a nice place to chill and bond with friends and family over a good meal. There are even things like We Bare Bears stuffed toys and card games that you can occupy yourself with! 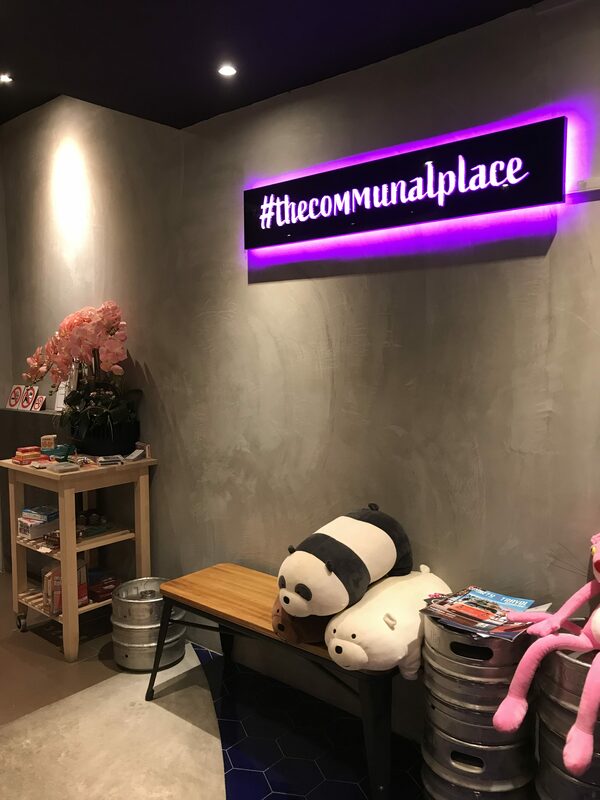 All in all, The Communal Place combines both casual environment and extremely good food- the perfect place to spend time with your loved ones.